Sorry about the absence. You know I would not stay away that long on purpose. Okay, so this is a drive-by posting but I want to show you some love, and also show my progress on the Dark and Stormy. Erm, yes, the D&S has grown some and then shrank back a bit again. One thing that hasn’t changed though is my choice of buttons. There will be 14 off these small pearl/shell buttons instead of the large ones shown on the pattern. During our first weekend at the new flat, the cardigan looked like this. Yes! 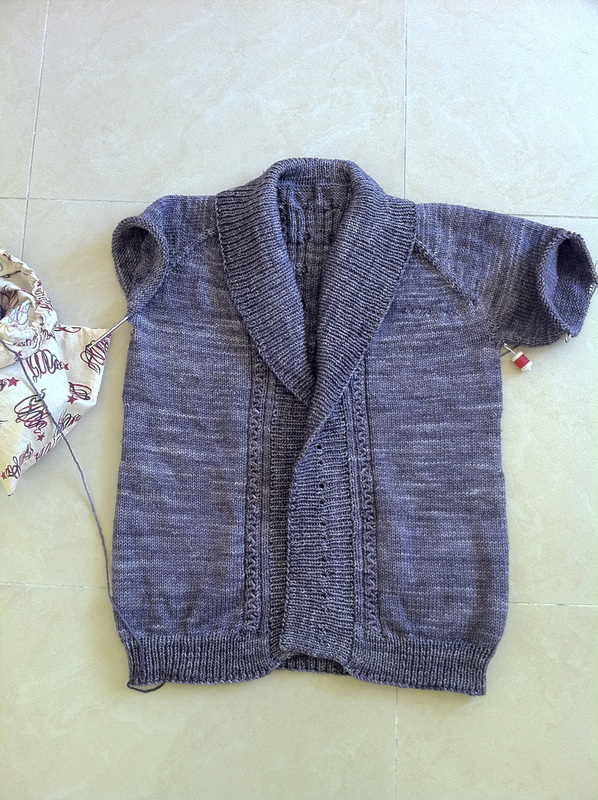 I have ribbing both at the hem and the buttonband and shawl collar! It didn’t feel like hard work at all. I actually enjoyed the change from stockinette and cables to ribbed stitches. Figuring out where the buttonholes should go on the buttonband needed a bit of brainpower but I think it turned out alright. I actually completed the left sleeve and showed it to the Amiras at our monthly meeting last week. Hala took this photo to show me how the back raglans did not line up right. The left is a bit too far than the right, which sat where it should be. She said it was because the left sleeve was short and I should knit about 2-3 inches more before the ribbed cuff. I contemplated this for the rest of the afternoon and when I got home that evening, I ripped the left sleeve down the 6th set of decreases. Side note: I love Love LOVE this yarn! It was scary but it was the right thing to do. I would not be able to ignore that lopsided back raglan and it will keep nagging at me. I am now working even on both sleeves at 62 sts as opposed to the 44 sts called for in the pattern for my size. I fail to remember that my arms are bigger than your normal female so I need to adjust the stitches for those too. I’m soldiering on and ignoring the fact that the first project for my personal sweater club is way past its deadline. 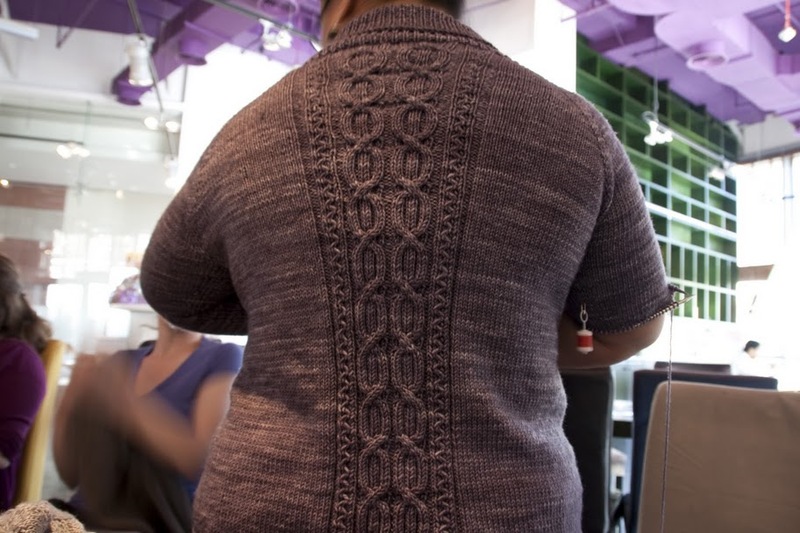 I’d rather have a cardigan that fits than live with all the nagging voices inside my head about how I compromised the quality of my work over a not-so-important personal deadline. Be right back with an FO soon. Glad to have you back, hope you’re all settled at the new place:) Good that you ripped the sleeve and re-knit because that would definitely bug you. 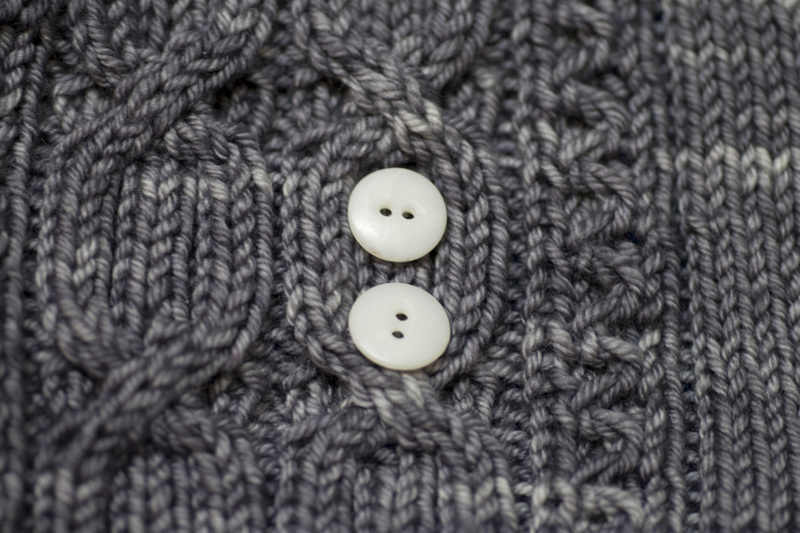 I love your button band idea with the smaller buttons paired and placed closer together. ohhh its looking sooo good. You`ll be glad you ripped when you see your perfect sweater at the end.